Freedom’s injured foot is so much better. It will still take a long time to fully resolve, but at least the gaping wound has healed. You might remember that Freedom stepped on his foot a few months back. It happened in the blink of an eye and the wound took forever to heal. Back in January, I reported that we were having issues with proud flesh (Bad Luck Comes in Threes). The good news is that it’s finally better. Two months of deep snow helped keep it iced and clean. 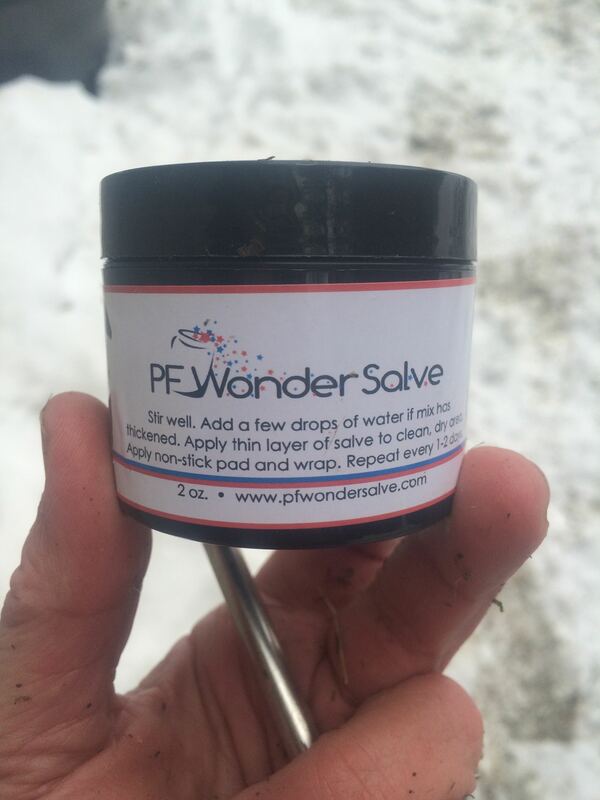 A nifty product called PF Wonder Salve, applied every couple of days, helped it heal. I can’t imagine what a nightmare it would have been had the horses been ankle deep in mud. There will be some long term implications: the hoof capsule is distorted and he will need some extra support as it all grows out, but I’m thrilled with the progress. The product helped the wound heal and restricted the growth of proud flesh. Of course, the bad news is also a result of the snow. While Freedom’s front hooves look good, his hinds are not-so-great. Normally, in the winter I pull his shoes and he emerges in the spring with beautiful feet. 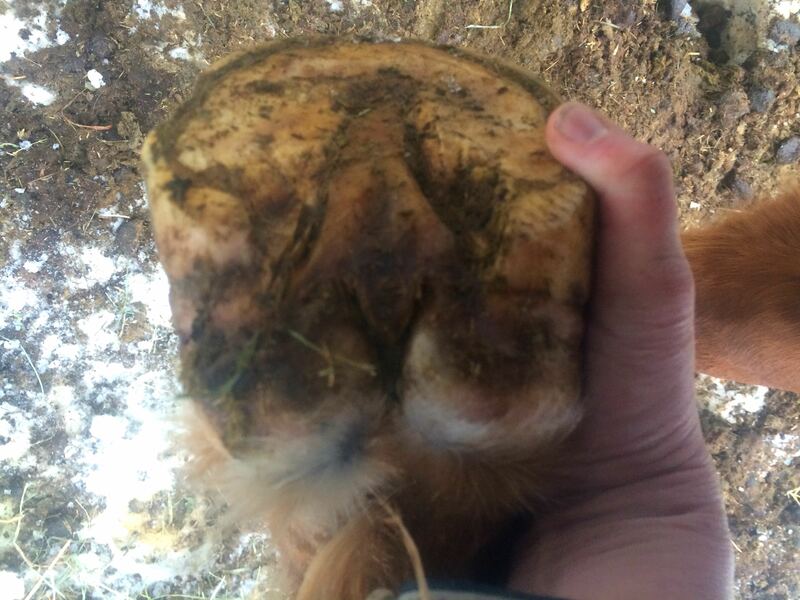 The nail holes grow out and the hoof is generally hard and healthy. Not this year. The hard ground we had earlier left him with very little hoof wall to nail to and bruises on his soles. The deep snow and the cold have meant that he hasn’t moved around much, even though he’s been turned out. Certainly the snow has helped cushion his feet but little movement = less growth. I’ve started him on a hoof supplement and I’m hoping that now that it’s starting to warm up, he’ll start to move around more and get the blood flowing through those hooves. I haven’t been able to ride since January, so I don’t know yet how tender his feet are under saddle. I’m thinking that he may need hoof boots in the spring to keep him comfortable — those, or glue on shoes. I’ve heard really good things about glue ons in every aspect except for price! Have any of you tried them? It will be awhile before his hind feet can hold shoes and with his tender TB soles, he will need some protection. aw poor Freedom. glad he’s healing up… but a bummer that his feet are in such rough shape.. i’ve also heard great things about glue-ons (aside from price haha), but no first hand experience. good luck! Very nice blog, and article!! I stumbled on your site while searching for PF Wonder Salve. Thank you for sharing that information, and for posting the photo. Regards. Thanks for reading! I had very good success with the PF Wonder Salve. Have considered using it on myself!